We are American Photographic Artists; our New York Chapter is comprised of a number of fantastic creatives, producers, editors, and agents--and we want to hang out with you. 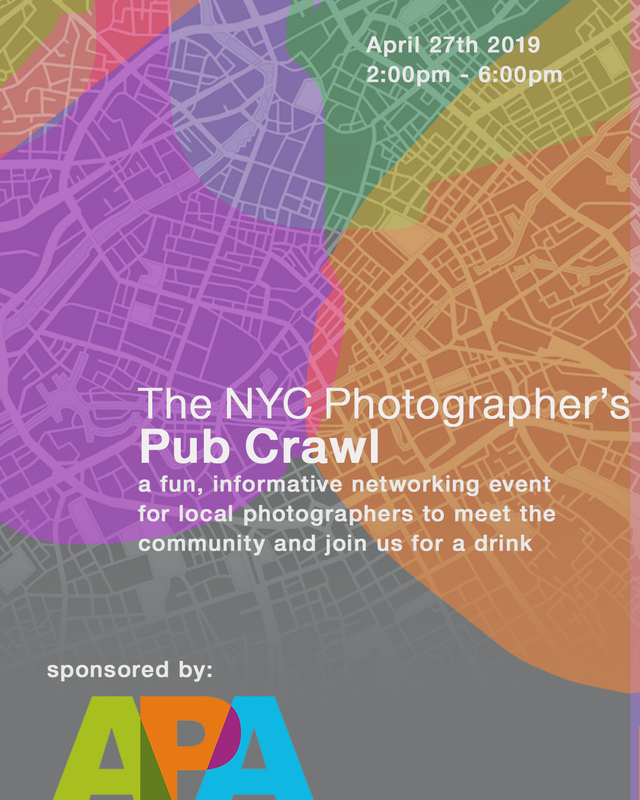 Join us on a pub crawl to learn more about how APA NY can help you protect your rights as a photographer, assist you with your growth in the market, network you with the right group of people, and hook you up with some sweet discounts. We’re on a mission to create a relaxed, judgement free, safe atmosphere for photographic artists in NYC and we’d be delighted if you join us. The event is free and everyone is welcome! Stay tuned as we release the schedule for bar locations. We will also be posting live via social media on the day of the event for everyone to follow along. IMPORTANT NOTE ABOUT THE EVENT: Must be at least 21 years old to participate; valid state ID required. Advertised drink specials, participating venues, and advertised times are subject to change and may vary APA|NY promotes safety and urges all participants to drink responsibly. Participants must show their ticket with a matching name to APA Staff in order to retrieve their wristband. This wristband will allow you to access the entire crawl and take advantage of the drink specials throughout the pub-crawl. By purchasing a ticket, you are agreeing to these terms.